Let’s Eat Out! series is a compilation of books, apps, and guides for people with food allergies. The Let’s Eat Out! series is a compilation of books, apps, and guides designed to help those with gluten and allergy restrictions educate themselves and eat safely in their own homes and in restaurants across the globe. 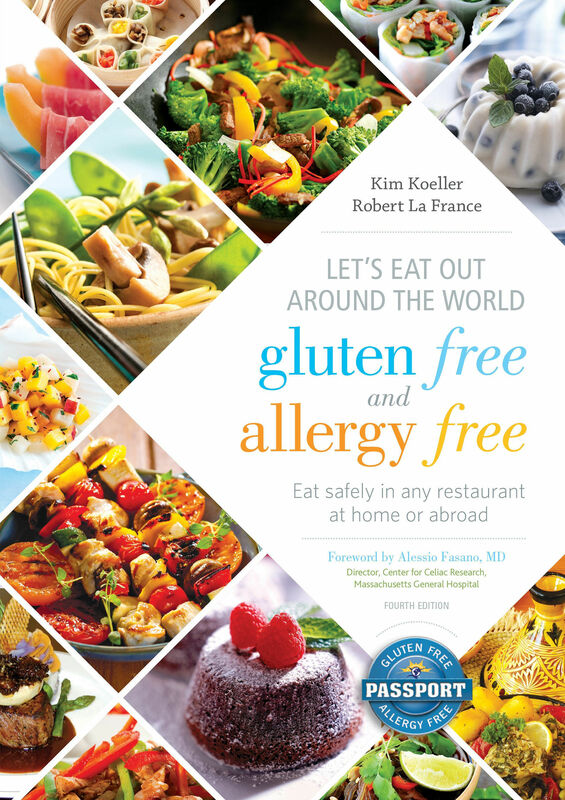 Kim Koeller’s knowledge and personal experiences living with food allergies, paired with Robert La France’s previous food industry experience, makes the two authors experts on how to live a life in control of a restrictive diet, especially one that has the traveling bug. Their newest book, Let’s Eat Out Around the World Gluten Free and Allergy Free outlines ways to cope with special diet requirements, using the groundwork of their own experiences. The book starts off with each author’s personal journey with dietary restrictions: Koeller, having been diagnosed with celiacs disease and multiple food allergies, shares her struggles with spending years finding a diet that keeps her happy, healthy, and energized. France, having worked in the restaurant industry for years, offers his professional knowledge and discusses his passion for helping those with dietary restrictions. It continues on to give an inspiring four-step process on how to come to terms with a special diet, sample menus of common cuisines around the world, helpful menu descriptions, food preparation tips, and travel suggestions, reminding the reader that their life does not have to be controlled by food restrictions. Instead, the book does a nice job encouraging the reader to educate themself and take their diet into their own hands. The combination of Koeller’s personal, relatable testimony, and France’s informative advice on how to make your dietary needs properly heard in a restaurant setting, make this book helpful, comforting, and believable. It effectively visits both sides of the eating coin, proving beneficial to both a consumer and producer, while understanding and articulately displaying what is needed in communication concerning gluten and allergy free eating. Let’s Eat Out! is more than just a book for traveling with eating restrictions; it’s an essential guide for living with, or living near someone with food allergies. As another part of the Let’s Eat Out! series, Koeller and France offer handy, “passport” sized booklets aimed to help communicate dietary restrictions and desires while traveling abroad. Using some of the most common food allergens as a base, the mini books focus on specific phrases and words to help people with allergies translate their food needs in other languages. The Multi-Lingual Phrase Passport provides translations in French, German, Italian, and Spanish for dietary key words and phrases such as, “I need to special order my meal due to my food allergies”, and “I have a condition called ‘celiac/coeliac disease’”. Specific food items and ingredients are also easily translated. The other passports, much like the Let’s Eat Out! book itself, focus on dietary needs in specific cuisines, such as French and Italian, Chinese, Indian and Thai, and even American Steak and Seafood restaurants. Within each booklet, there are once again sample menus, tips for ordering with allergies, detailed descriptions of popular food items, cultural dining customs, and helpful, easy-to-read charts that pinpoint which foods pose an allergy threat. These mini books are small and thin, making them very easy to store and carry. They are also relevant in not just restaurants, but also hospitals, pharmacies, and food and drug stores, making them a wonderful addition to any traveler. They provide translations for restaurant conversation, but also health safety, including requests to see a doctor, symptoms for allergic reactions, and even simple supermarket requests for “allergen free products” such as fresh fruits and vegetables, to nut-free, organic foods. I also greatly appreciated the fun “Dining Considerations” found at the beginnings of chapters that provided interesting factoids on each cultures typical dining experience, such as France’s 2-4 hour dinnertimes and advice on how to prepare oneself for the large portions of American food! Although all of the translations are organized in a helpful, alphabetical and categorical format, I did find myself wishing for an index at the back of the Multi-Lingual booklet for even quicker translation help. I can easily see someone trying to simply translate the word “corn” in Italian, and having to flip through countless pages of detailed gluten-free appetizer descriptions. Some of the phrases were also worded strangely, such as, “Is this food fried in the same fryer as items fried with breading?”. Moments like this come across as redundant, oddly specific, and a little too formal, being almost laughable at times. The cuisine booklets also do not feature any translations, however, if used alongside the Multi-Lingual Phrase booklet, the passport series is a very compact, effective way to communicate dietary needs in other countries. The Let’s Eat Out! series also features a number of gluten and allergy free apps available for just under $5, and each have an allergy friendly goal. For the iPhone, the app “iCanEat” focuses on fast food locations, while “iEatOut” focuses on ethnic restaurant cuisine, allowing you to customize a pre-made menu of hundreds of common items according to your diet needs by selecting allergy concerns and reading food descriptions. It also largely draws directly from content in the Let’s Eat Out! book itself, requiring no internet connection to do so, which is a very nice perk. The Android apps were a little less effective, as the gluten-free dining app is separate than the allergy free app, meaning purchase of each one separately is required. Wi-Fi is also a necessity in order to run the Android apps, which makes it a less than ideal option for non-Apple users. Another app also provides information on gluten and allergy free options while flying with certain airlines, while the free app allows you to print out translation cards, (very similar to the content in the Multi-Lingual Phrase passport). The best perks about this option is that not only are they free, but they translate in 13 languages, as opposed to just the four featured in the Multi-Lingual Phrase Passport. The cards are also a fantastic alternative to someone without a smart phone or access to Wi-Fi. While the Let’s Eat Out! series overlaps a lot of information, it is all information that is concise, vital, and necessary to communicating special dietary needs, and Koeller and France have done a wonderful job making it accessible through a number of outlets.